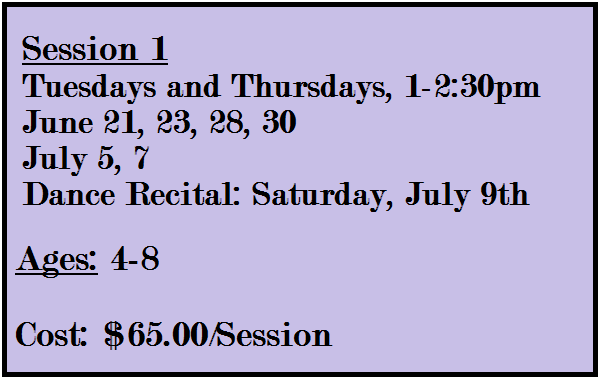 The Gilford Youth Center is excited for this new and exciting summer dance program for children, ages 4-8. This fun and educational program will introduce several styles of dancing, in a safe and positive environment. Children will build coordination and confidence, healthy hearts and flexible bodies. It will also give your child a love of dance and a feeling for music. The session will end with a special dance recital for parents, families and friends. ​Our talented teachers create welcoming classes that balance learning with fun so that our dancers are always improving with a smile and a giggle! Catherine Buckley has been dancing for 18 years and specializes in tap dancing. Throughout her career as a dancer, she has been trained in tap, jazz, hip hop, lyrical, and ballet. Catherine Danced at Broadway North during her earlier years as a dancer, and continued her studies at Creative Steps School of dance. She has also been a part of two pre-professional tap companies: New England Tap and Speaking in Taps, both of which were run by Aaron Tolson. Catherine has also choreographed tap dances for the Roger Williams University Dance Club. Karina Tomlinson has been dancing for 15 years and competitively dancing for 9 years. She is finishing her senior year of dance at Creative Steps School of Dance in Tilton, NH. She has also been in two tap companies, New England Tap Ensemble and Speaking in Taps. She will be continuing her dance career at Endicott College in the Fall.